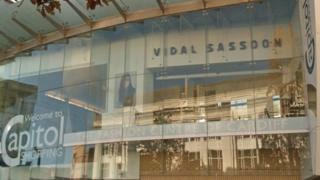 Vidal Sassoon's only hair salon in Wales is to close, blaming a lack of information about the redevelopment of the shopping centre where it is based. It is in Cardiff's Capitol, which the firm said had "suffered" following the opening of St David's shopping centre. Managing director Jackie Lang said: "With numerous retail units leaving the mall, it has resulted in a significant reduction of footfall." Capitol owner NewRiver REIT said it was exploring redevelopment possibilities. Ms Lang said the reduction in footfall at the mall had "adversely affected the revenues and profit of the salon and we have been left with no alternative but to exit this location". She said: "During the last couple of months we have been working hard to negotiate with the landlord to understand the plans and timescales for the redevelopment of the centre, together with their current strategy to improve the customer visits. "Unfortunately, timescales and plans were not sufficiently locked down to encourage us to sign a new lease for the business. "In these circumstances, our first priority is always to the team and we have presented every team member with a number of options." The salon currently employs 18 members of staff. "We have been in consultation with them over the past few weeks and despite wanting to retain all of the amazing talent, unfortunately, as most of them have their lives in Cardiff, it is not been a suitable option for the majority to relocate to another part of the country with Sassoon; therefore their positions will fall redundant," Ms Lang said. "However, there are a few team members who have requested transfers to London and Beverly Hills which we are currently exploring. "We are continuing to support the leadership team of the salon to identify future opportunities available within Cardiff. "This decision was not taken lightly and we are extremely disappointed Sassoon will no longer have a presence in Cardiff." Charles Spooner, director of NewRiver, said it purchased Capitol in 2016 "as a long-term investment opportunity, with redevelopment as the central focus". He said: "The Capitol has an important role to play in the city and we are continuing to explore possibilities for a development to improve and enhance the centre, and complement the wider city centre retail and leisure offer. "A great deal of work is taking place behind the scenes as part of a commitment to deliver a development which will complement the wider city centre retail and leisure offer. "The Capitol is a major part of Cardiff's retail hub. We are looking forward to having the people of Cardiff help shape the future of the Capitol Centre, and we hope to share more information on this soon." The Capitol opened in 1990, with the Sassoon salon one of its first stores. The centre was redeveloped in 1999, but in recent years a number of stores including H&M, MAC, Jaeger, Austin Reed and Soho Coffee Co, have moved out.